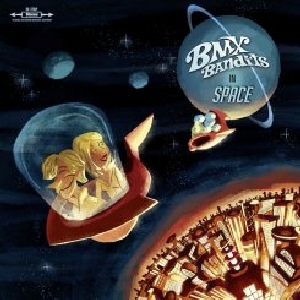 Discussions Magazine Music Blog: BMX BANDITS/BMX Bandits In Space: Available November 27th, 2012! BMX BANDITS/BMX Bandits In Space: Available November 27th, 2012! The sixteenth release from Duglas T Stewart’s group comes surrounded by lots of big news. The first big news is that this new album includes the return of two of BMX Bandits' original members, neither of whom have worked with the group since its beginnings, sometime around 1985. Jim McCulloch (Snowgoose, The Soup Dragons) is not only back in the line-up but also participated intensely in the song-writing process for many of the tracks, and Sean Dickson (The Soup Dragons) wrote the album’s opening and closing tracks. Second, another regular collaborator who has returned to the fold is the ubiquitous Norman Blake (Teenage Fanclub), who plays several instruments and coproduces the captivating “Still”. Finally, what we have here is a kind of space-pop-opera - one of the best records from one of the most charismatic characters in the history of indie pop.